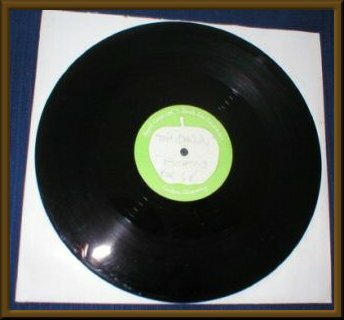 45 RPM THE BEATLES - UNRELEASED 10" ACETATE OF OH DARLIN', ORIGINAL 10" APPLE CORPS LABELED ACETATE OF OH DARLIN' WHICH HAS DIFFERENT LYRICS [see below] TO COMPARED WITH RELEASED VERSION. 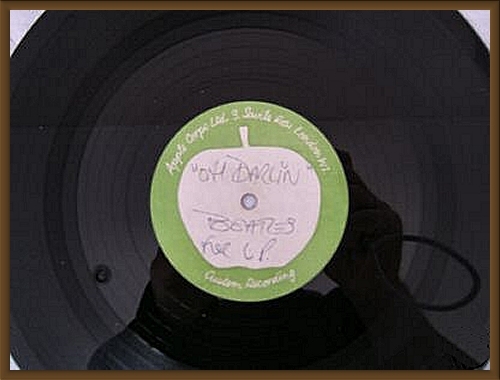 THE LABEL HAS BEATLES OH DARLIN' FOR LP PRINTED IN BIRO PEN. AND IS A ONE SIDED DISC, OTHER SIDE IS BLANK. THIS ITEM WAS PURCHASED THROUGH FLEETWOOD OWEN AUCTION HOUSE IN THE YEAR 2000. 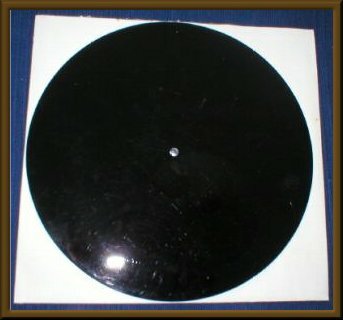 THE CONDITION OF THE ACETATE IS VG BUT PLAYS OK. WITH NO SKIPS, NO JUMPS AND IS VISIBLY CLEAN AND SHINY. (Different lyrics again. Lennon harmonising on 1st line. No "Oh! believe me darlin' " after second line. Apple Corps Ltd. 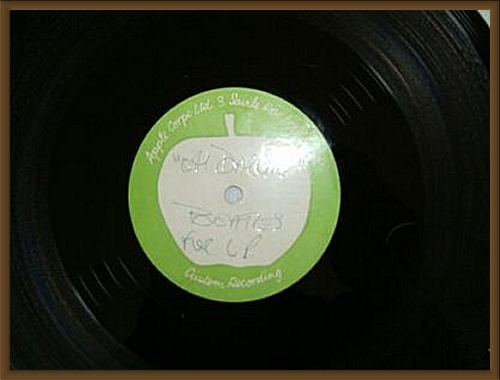 Custom Recording green and white label, titled in blue ballpoint pen "OH DARLIN' " BEATLES FOR LP. Lovely clean label with no smudging or any signs of aging. One small indent across it which can only be seen if held up to the light - otherwise as new. Standard white cardboard 10" cover with polythene inner. Very clean, with original sheen and lustre almost 100% intact. Could this be because this particular cut was never used for the album? A few scuffs and scratches on the vinyl, but very little wear indeed considering this is an acetate. There is a very very small 4 4 number visible in the run-off groove. The recording is a subtly different version to that which appears on the original album/CD, with some different lyrics and intonations. One would speculate that this was an earlier take not ultimately selected (4 4 = 4 April, perhaps?). Below I have outlined the variations in the lyrics and the vocals as accurately as possible. Purchased at Fleetwood Owen in October 2000 at their first auction at the Hardrock Cafe - the one where the John Lennon piano went for £1.3 million. I have the original bill of sale. The different take version was not advertised/noticed by them. I only noticed the difference when I got the record home and played it and noticed the subtle differences. Feel free to ask any questions you like about the recording. I don't mind posting the item to the winner, though because of the brittle nature of the record, you may be better advised to arrange to collect it after the sale. Oh! Darling, please believe me Different lyrics to original. I'll never do you no harm Lennon harmonising on 1st line. I'll never do you no harm after second line). instead of CD’s single “oo”. harm”, compared to gritty upbeat CD version.